H-E Double Hockey Sticks recently went on tap at Fox River Brewing. This is a German-style Helles, the Bavarian answer to Pilsener, but with less hop bite and more malt presence. In this case, that malt brings subtle notes of biscuit and honey. The understated hop flavor adds just enough spice to keep things in balance. This is a companion beer, easy drinking and flavorful. It's one of the better examples of the style I've tasted from a Wisconsin brewery. H-E Double Hockey Sticks is the work of Fox River assistant brewer Dylan Jones. This is the first time Jones has had one of his beers in the Fox River pipeline. Jones began working up this recipe on a homebrew system in the fall of 2017. For the Fox River iteration, he went authentic using all German malts and a traditional, German hopping technique known as first-wort hopping, wherein hops are added to the wort as it is being collected prior to boiling. Jones is happy with the results. "It turned out better than I'd hoped," he says. "And all the attention just makes me feel a little more confident in my choice to continue brewing as a career and a hobby. Hopefully, my next creation turns out just as well." H-E Double Hockey Sticks is 5.3% ABV available now on draft at the Fox River Brewing Company Taproom in Oshkosh. 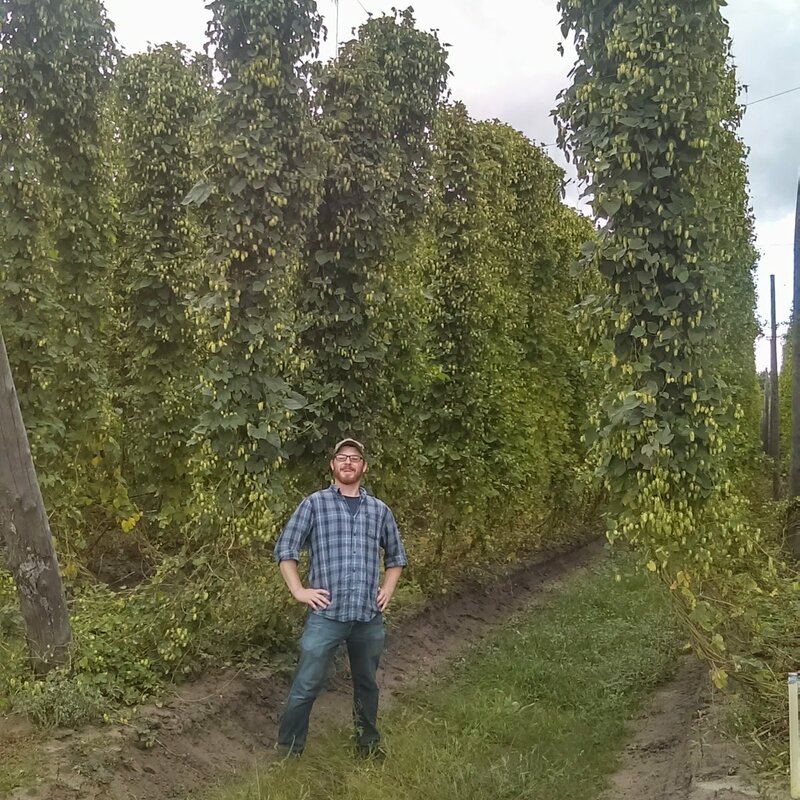 Fox River's Dylan Jones in a filed of hops. There have been 21 breweries in Oshkosh since Jacob Konrad launched the Lake Brewery here in 1849. The peak year was 1878 when the city had nine breweries. Today, we have four. And that's about the average over the course of the city's history. So, where in Oshkosh were all these breweries? I've made an interactive map to answer that question. 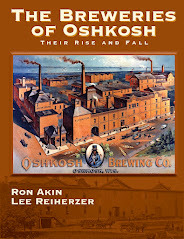 The map below shows the location of every Oshkosh brewery from 1849 until right now. Click on any of the beer mugs in the map and it will pull up the brewery located there and its dates of operation. Zoom in to draw a better bead on where a brewery was within a particular neighborhood. To get the full experience, click here and view the full map in a separate browser window. Prost! In 1888, Horn and Schwalm’s Brooklyn Brewery was the largest brewery in Oshkosh. That big facility on Doty Street was pumping out nearly 10,000 barrels of beer annually. Horn and Schwalm’s Brooklyn Brewery. The Brooklyn Brewery sat 100 yards from the shore of Lake Winnebago. That was a convenient place to be. 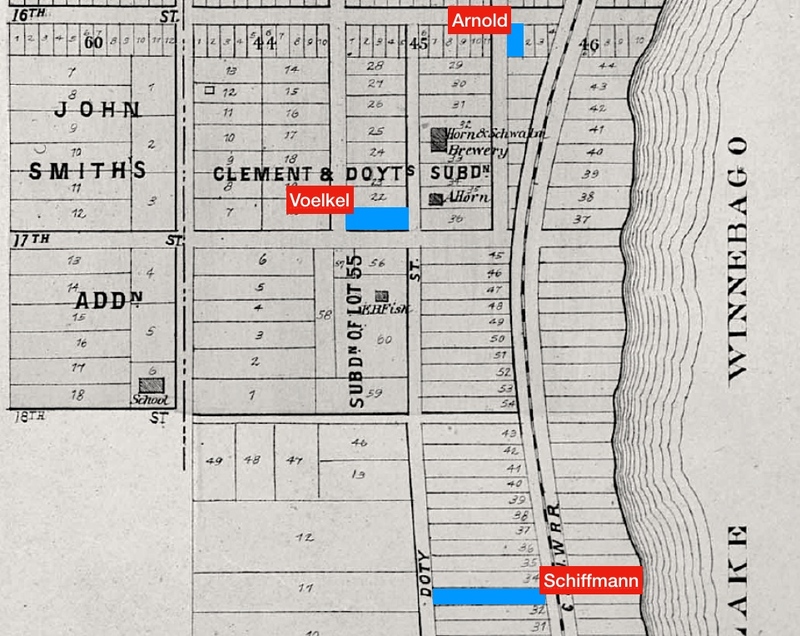 Horn and Schwalm used their lakeside location to distribute beer on ships traveling the Winnebago waterways. 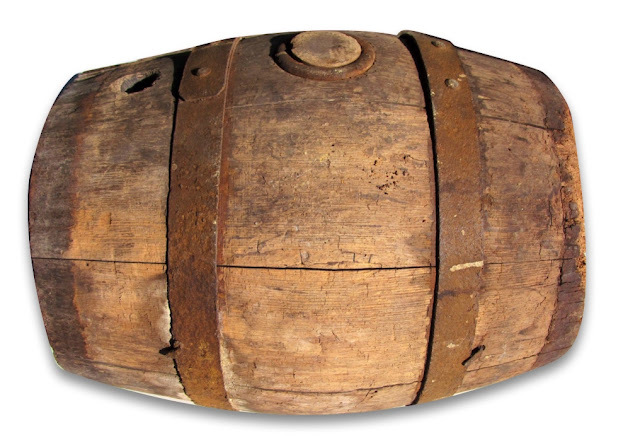 The beer they sent out on those ships was packaged in wooden kegs. They’d seal the insides of those kegs with molten pitch. When the pitch cooled it formed an antiseptic coating over the interior of the barrel, which helped prevent bacteria lurking in the wood from spoiling the beer. Here's one of those barrels from Horn and Schwalm’s Brooklyn Brewery. Despite all the care, sometimes the beer in those barrels went bad anyway. Here's an instance of that happening as reported by the Oshkosh Daily Northwestern on April 4, 1888. Capt. Bangs endeavored to land with the K.M. Hutchinson yesterday near Horn & Schwalm's brewery to unload a number of kegs of beer returned from a northern point as sour. The steamer became stuck and the captain was obliged to dump the kegs overboard and float them to shore. The K.M. Hutchinson docked in Oshkosh, 1887. Wooden kegs of sour beer being tossed off that boat and floating to shore on the south side of Oshkosh. I would have loved to have seen that. The occurrence was a minor setback for Horn and Schwalm. 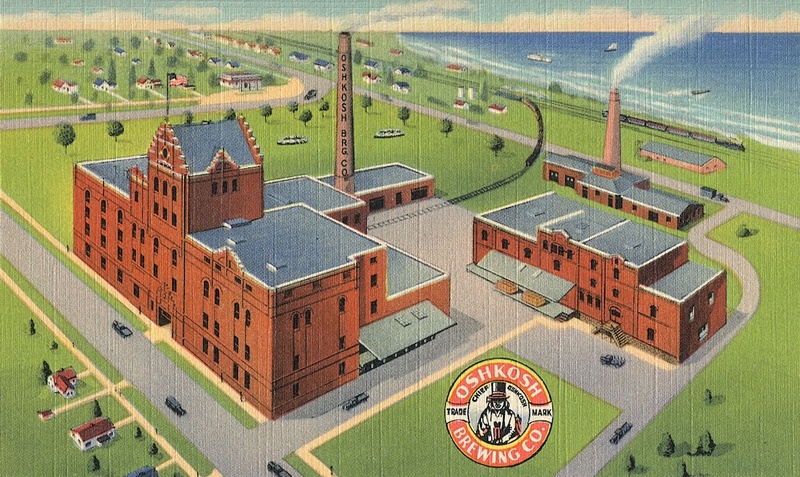 The brewery continued its explosive growth into the 1890s when it merged with two other Oshkosh breweries to form the Oshkosh Brewing Company. The K.M. Hutchinson didn't fare as well. 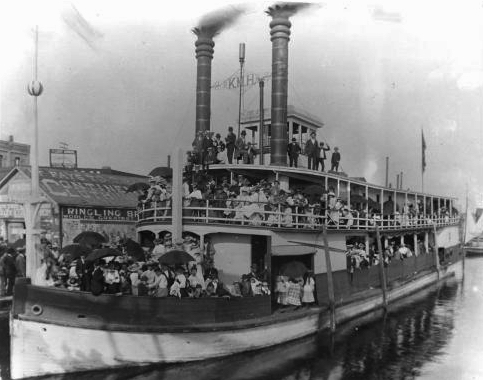 It was once described as "the strangest vessel that ever plied the Fox and Wolf Rivers." The ship sank several times before catching fire in 1895 and burning down on a sandbar between Lake Poygan and Lake Winneconne. Emelius Prawl Bangs, former captain of the K.M. Hutchinson (from Oshkosh Down Under). After his ship was destroyed, E.P. Bangs needed a job. He wound up spending the summer on the south side running the horse carousel at EWECO Park. A single season of that was enough for Bangs. When summer ended, he launched Bangs Rapid Transit Company. He had one horse and one wagon. Bangs Rapid Transit in front of the Oshkosh Public Library (from Oshkosh Down Under). Bangs had better luck carting his freight on land. His transit company, which became E. P. Bangs Trucking, operated in Oshkosh until 1981. Bangs was long gone by then. He died in 1930 at the age of 75. They still called him Captain. 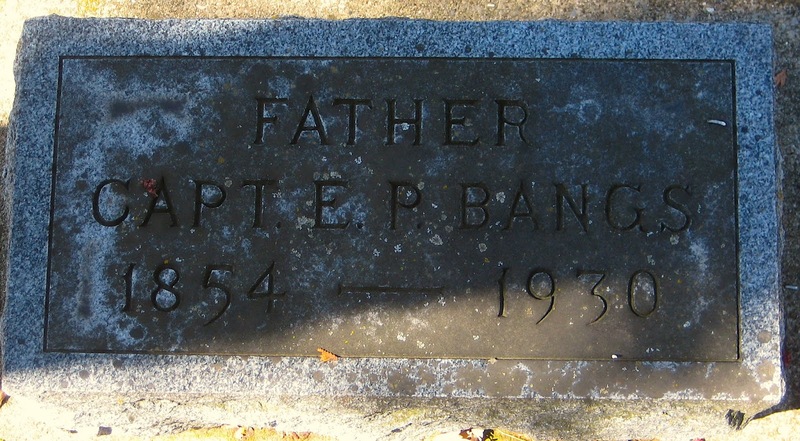 Bangs is buried in Riverside Cemetery. For more on E.P. Bangs and his transit company, check out Julie Krysiak Johnson’s excellent book Oshkosh Down Under. In the 1870s, a new type of brewery sprang up in Oshkosh. They made what was known locally as white beer. American white beer of the 19th century was a reconstruction of the Berliner Weisse style; Weisse being the German word for white. Like its European counterpart, white beer was pale, light bodied, and sour. It was fermented with a mixed-culture of ale yeast, Lactobacillus, and Brettanomyces. The grist was composed of barley malts, sometimes wheat malt, and often corn. It was very lightly hopped. The resultant beer was thirst quenching and highly effervescent. It was also low in alcohol. Just right for summer drinking. Its popularity in Wisconsin grew dramatically in the 1870s. And with that, white beer breweries began appearing in Oshkosh. 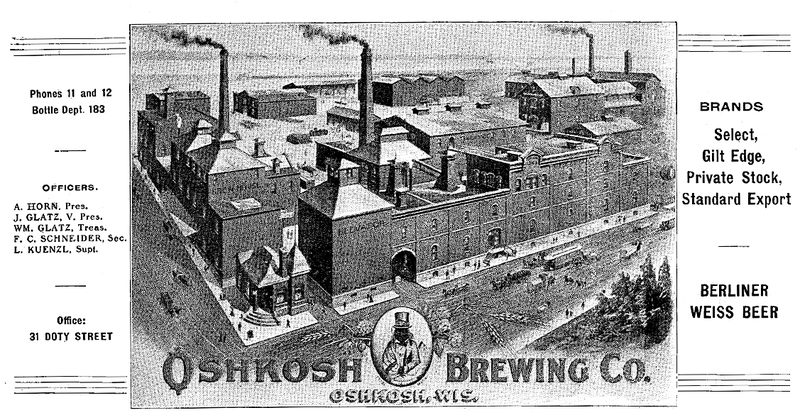 Oshkosh’s white beer breweries were substantially smaller than the lager beer breweries that were pervasive here in the 1870s. These were rudimentary breweries. They operated from private homesteads, often in conjunction with some other business. 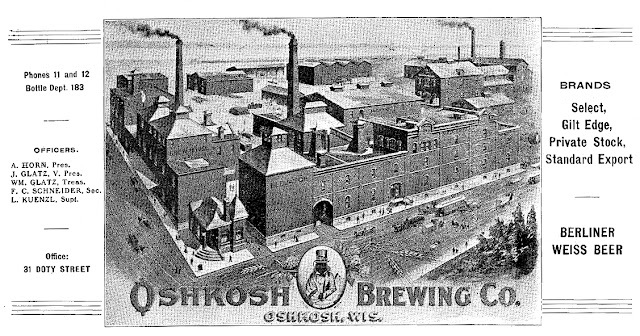 Oshkosh's first white beer brewery was launched by Leonard Schiffmann, a German immigrant who came here in the mid-1860s. By 1868, Schiffmann was running a saloon in the area that is now 416-418 North Main. That didn't last. His saloon was destroyed in July 1874 when fire leveled much of downtown. Two weeks after the fire, Schiffmann purchased land on Doty Street. There, he opened a white beer brewery with his son Andrew. 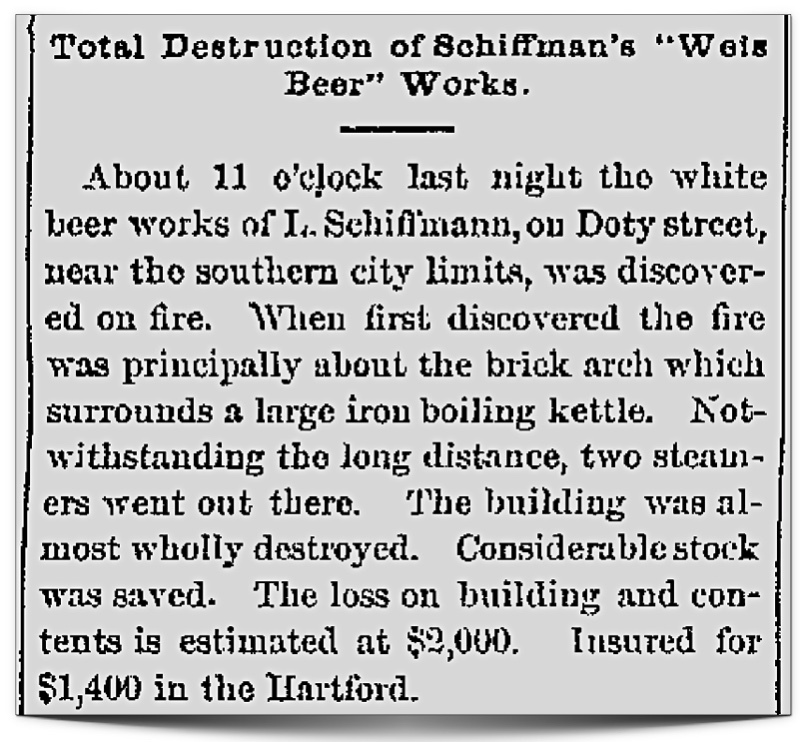 The Schiffmann brewery appears to have been up and running by 1875. It was located on the east side of Doty, south of 18th. 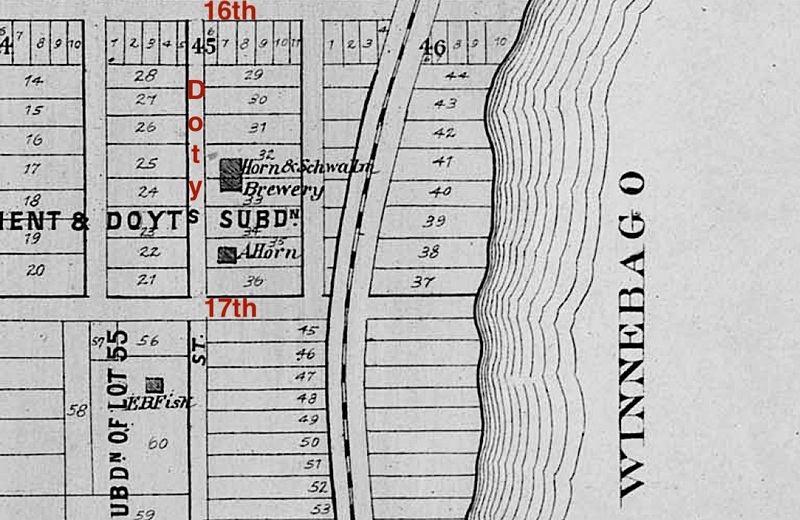 What was the brewery property is currently addressed as 1864 Doty. That area of town in the old 3rd Ward would become the base for white beer brewing in Oshkosh. From the 1879 Oshkosh City Directory. Like most brewers of white beer, Schiffmann bottled his beer. It underwent a secondary fermentation in the bottle imparting a level of carbonation often compared to that of champagne. That was more pressure than most glass bottles could sustain. 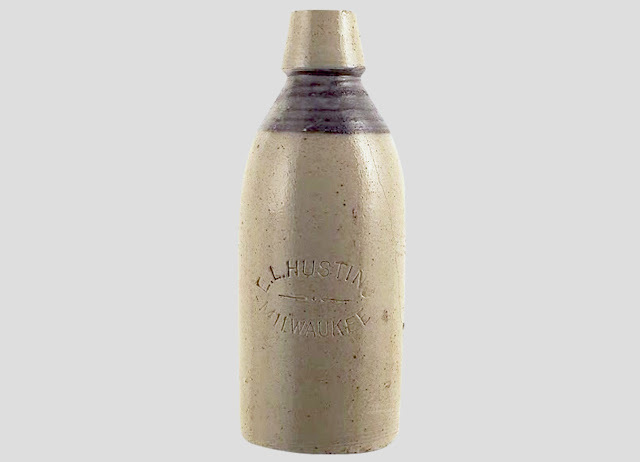 So like many early white beer brewers, Schiffmann packaged his beer in stoneware bottles. Several of Schiffmann's bottles have survived. 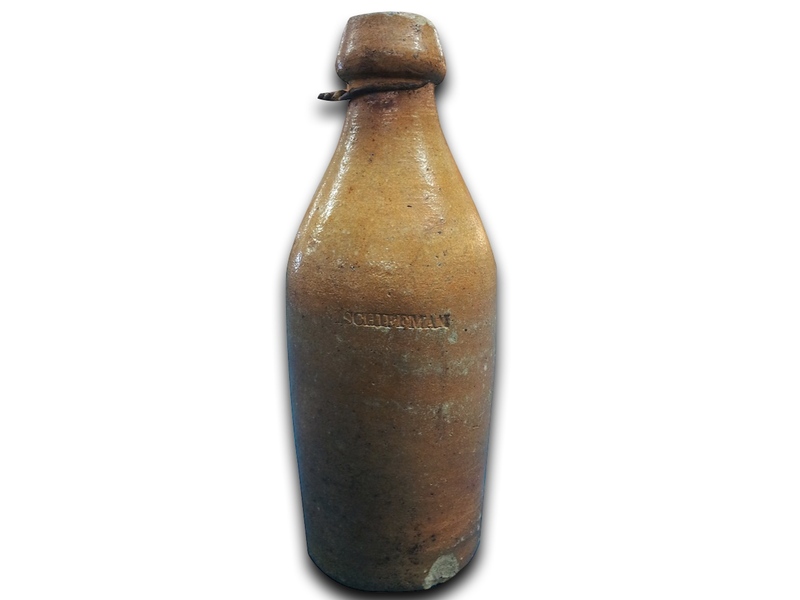 The bottle below, with "L. Schiffman" stamped just below its shoulder, was found in 1962 during a construction dig near the corner of Ceape and Main streets. Leonard Arnold launched his white beer brewery shortly after the Schiffmann's opened theirs. 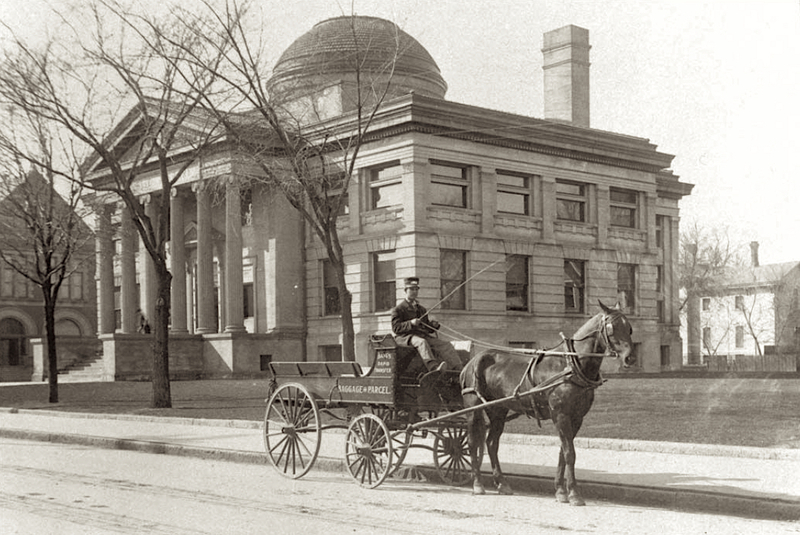 In 1875, Arnold purchased land at what is now 1610 S. Main Street. He was across the street from Horn and Schwalm's Brooklyn Brewery and just a block up from the Schiffmann place. By 1876, Arnold was making beer. He also made vinegar, a fairly common practice among white beer brewers. The Arnold Vinegar and Yeast Company would continue to operate well into the 1920s. 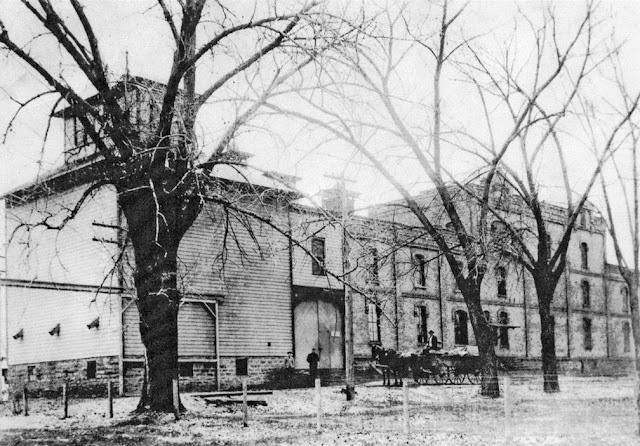 In 1879, a third white beer brewery was operating on the south side in the old 3rd Ward. 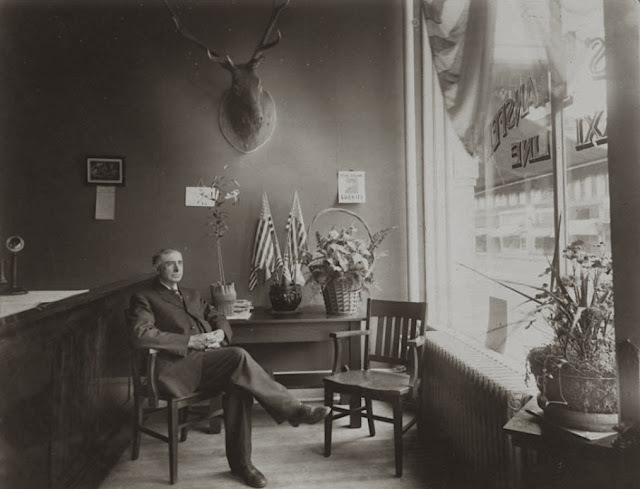 The brewer was Frederick Voelkel, a saloon owner and sometimes butcher. Voelkel's brewery appears to have operated in conjunction with his saloon at the northwest corner of Doty and 17th streets. 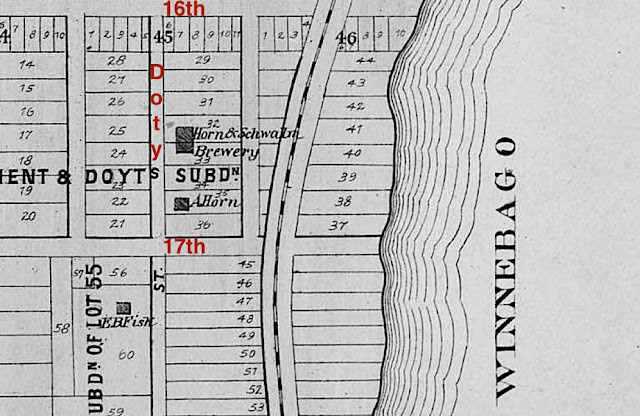 Today that land is addressed as 1673 Doty Street. 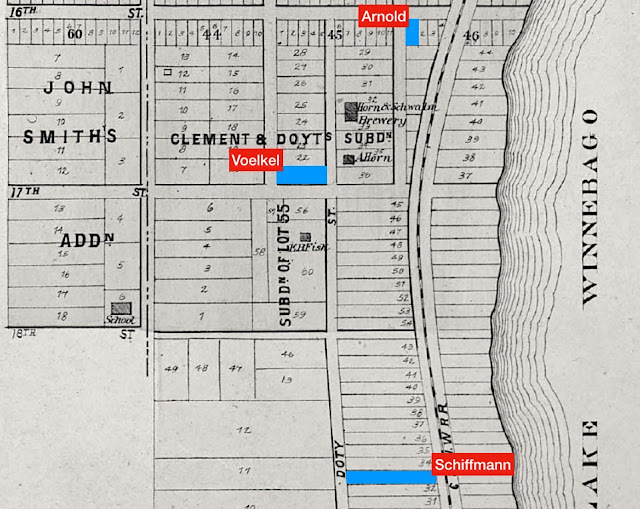 The blue boxes indicate the locations of Oshkosh early white beer breweries. By the end of the 1870s, these small, simple breweries were being set upon by larger breweries specializing in white beer. 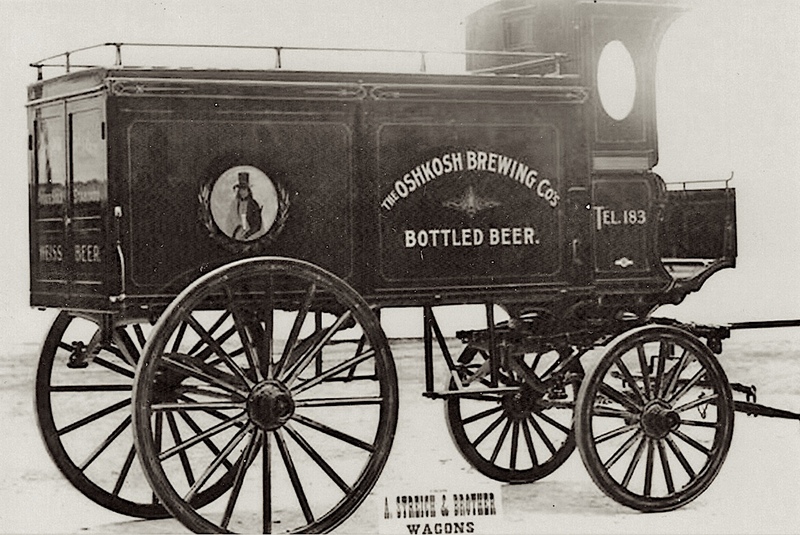 These "shipping" breweries sent their product into Oshkosh by rail and commandeered the local market. One by one, Oshkosh's white beer breweries closed. Frederick Voelkel's brewery closed in the early 1880s. The Arnold brewery had stopped making beer by 1881. The Schiffmann brewery was destroyed by fire in 1879. The Daily Northwestern's report on that fire gives a rare, though meager, glimpse inside an Oshkosh white beer brewery. Oshkosh Daily Northwestern, May 31, 1878. Schiffmann bounced back. In 1880 he was making white beer again. But the competition finally grew too stiff. 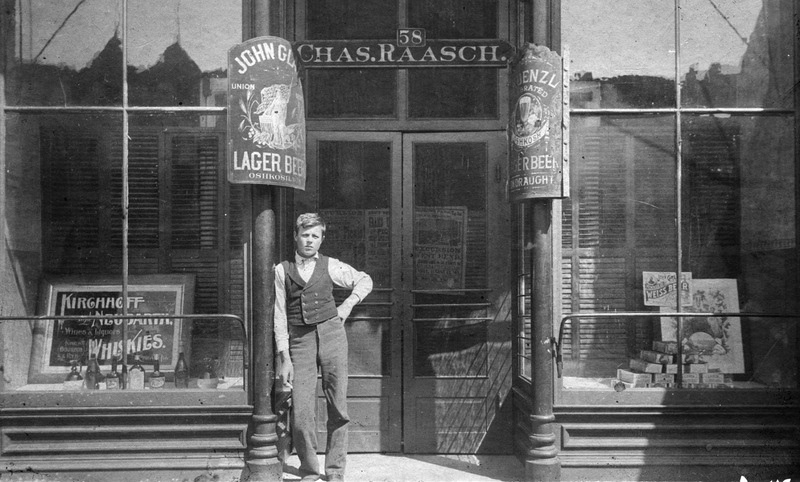 In 1883, Schiffmann shuttered his brewery and moved to Montana. Oshkosh's white beer breweries were gone. People here still had a taste for the beer, but now it came from Milwaukee. In the 1880s, the John Graf Brewery and E.L Husting Brewery, both of Milwaukee, were sending their white beer into Oshkosh. Husting used the Charlie Marsch saloon as its local depot. Marsch was on the west side of North Main Street near the river. He sold Husting’s white beer by the bottle and also on draught, which was something of a rarity in the world of white beer. John Graf was the white beer heavyweight here during this period. Graf’s beer was widely available in Winnebago County. As the turn of the century approached, brewers like Graf ditched the prosaic white beer appellation in favor of the Teutonic weise, weiss, or weisse. The spelling was apparently at the discretion of the typesetter. The ad below, from 1898, targeted the northern portion of Winnebago County. It was typical of the upscale image Graf like to project. 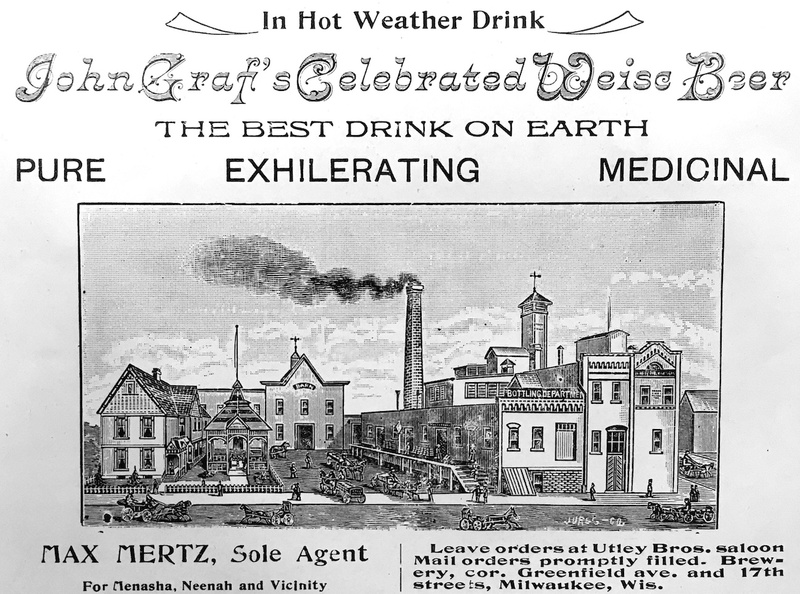 Here’s another ad for Graf’s Weiss Beer. This one appeared in the mid-1880s in the window of Charles Raasch’s saloon on North Main in Oshkosh. You can see the Graf placard in the window on the right. White beer’s last burst of popularity here began at the turn of the century when the Oshkosh Brewing Company introduced its Berliner Weiss Beer. OBC was something of an anomaly in this regard. Most lager beer brewers steadfastly avoided making white beer. The souring bacteria necessary for its fermentation was anathema to any brewer whose business was reliant upon the production of "clean" beer. Contamination was a near mortal fear. But OBC had an advantage most other lager breweries lacked. The company had three separate production facilities. 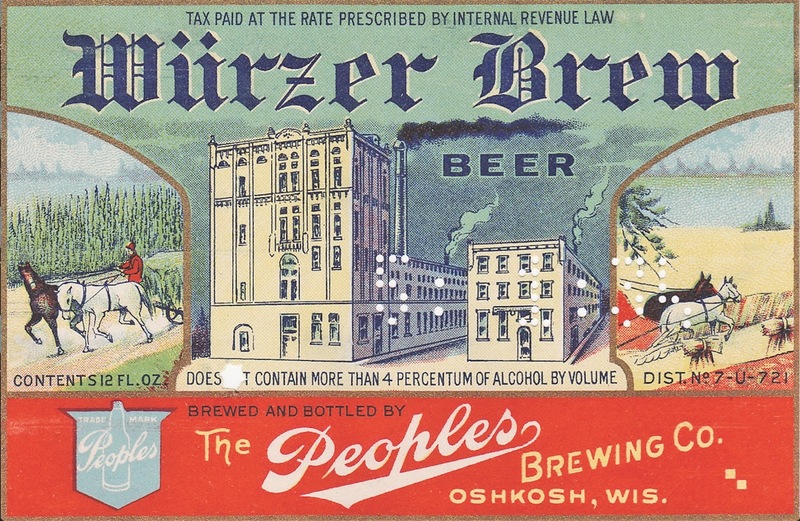 One of them, the old Kuenzl Brewery on Harney Avenue, was no longer making beer. OBC had been flirting with the idea of turning the Kuenzl plant into a white beer brewery since the merger which created the company in 1894. Finally, in 1899, OBC pulled the trigger. A 1903 ad featuring OBC's Berliner Weiss. OBC's Berliner Weiss Beer became the brewery's fastest growing brand. In March 1900, a brewery spokesman told the Daily Northwestern, "The indications at present are that the business in Weiss Beer alone next year will be doubled." Berliner Weiss remained a bottled beer, but the stoneware bottles Schiffmann had used were now passé. OBC's Weiss was sold in heavy, glass bottles capped with a swing-top ceramic stopper. 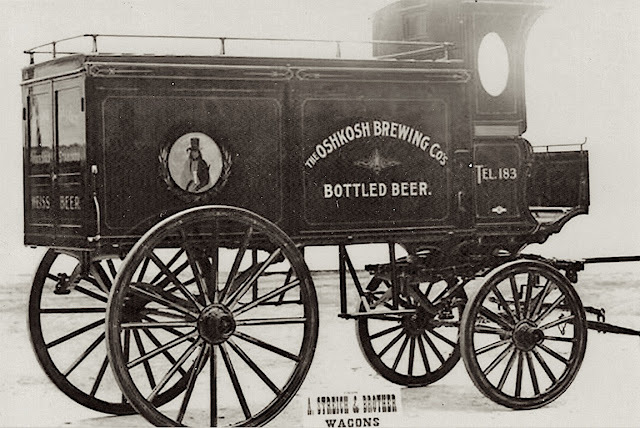 Here's one of OBC's bottled-beer delivery wagons. Across the back gate you can see the words WEISS BEER. Incidentally, it appears OBC used no wheat malt in its Berliner Weiss. Inventories for the brewery during this period show plenty of barley malt, corn, and rice, but not a shred of wheat. Purists held wheatless Weiss in low regard. The 1901 edition of the American Handy Book of the Brewing, Malting and Auxiliary Trades notes, "(Corn) grits will under no circumstances yield those albuminoids that give Weiss beer its character, as wheat malt does. Certainly there seems no reason why American Weiss beer brewers should not be able to procure a good wheat malt." People in Oshkosh didn't seem to miss the wheat. Berliner Weiss remained one of OBCs main brands of bottled beer until 1906. But as the decade came to an end, sales of OBC’s Berliner Weiss began to slump. Tastes were changing and the beer changed with it. 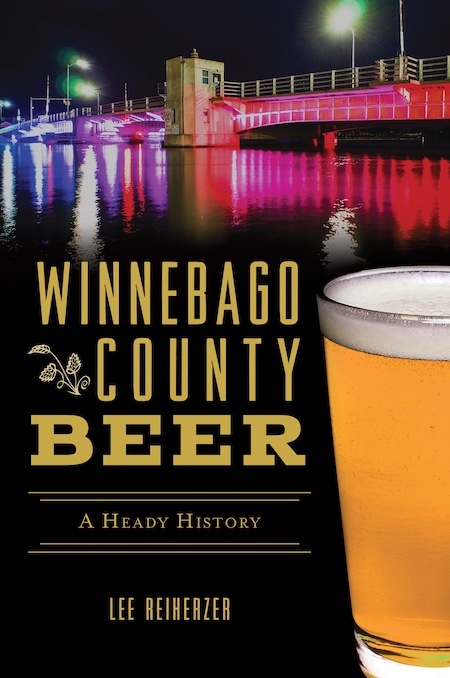 White beer's best years in Oshkosh coincided with a time when beer variety here was at its peak (present era excluded). Brewer's in Oshkosh were making beers ranging from pale and hoppy to dark and malty. But in the early 1900s, lighter, crystal-clear lagers began to win out. The older, more rustic and flavorful beers fell away. White beer, cloudy and sour, didn't stand a chance. 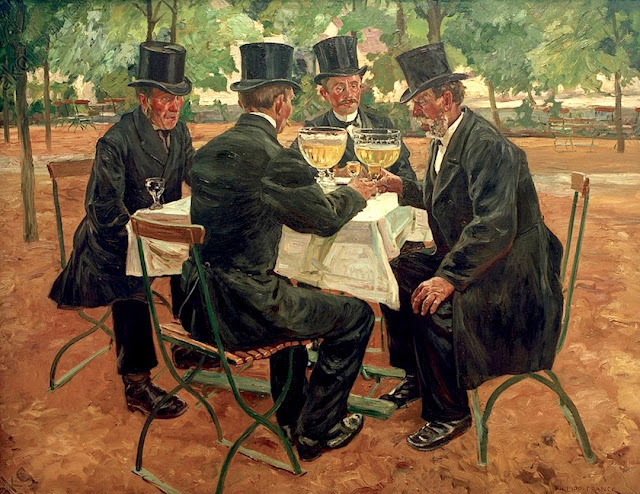 By 1911, OBC had abandoned the production of Berliner Weiss. That was the end of white beer in Oshkosh. More than 100 years later, Fifth Ward Brewing brought the production of sour beer back to Oshkosh. In early 2018 Fifth Ward released its first sour. A series of sour beers have followed. Unlike the old white beers, though, Fifth Ward's sours are aged on fruit. They've become a popular feature on the brewery's tap list. We're a long way from the days of Schiffmann, but the thirst for a locally-brewed sour remains.